Established over 1200 years ago, the castle town of Schleiz is located in the midst of a densely wooded region of Germany between Vogelsberg and the Rhone. The old town has many picturesque half-timbered period houses and the landscape is dominated by four stately fortresses which originally formed part of the town’s medieval defence system. 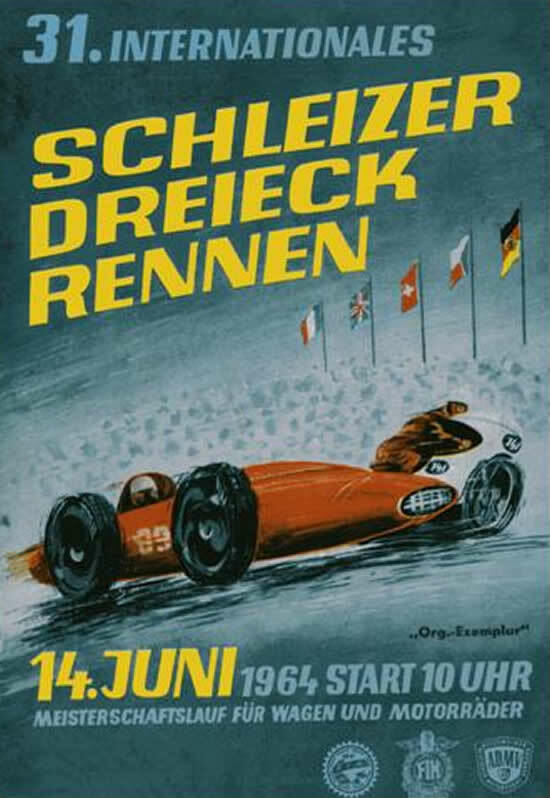 Built in 1923, the race circuit at just under 8 km in length, and the oldest in current use in Europe is a great road racing circuit. 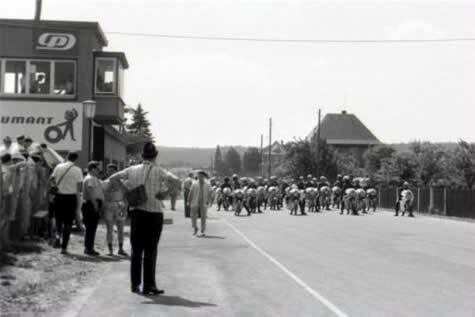 The setting has often been compared favourably with Spa-Francorchamps in Belgium and even the Isle of Man. 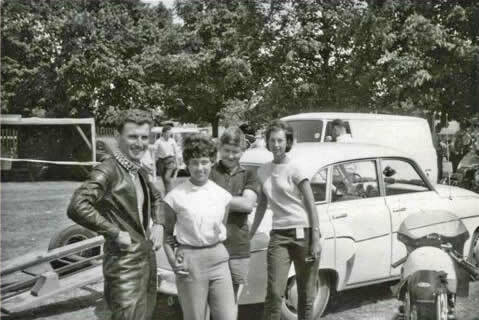 My entries for the 125 and 250cc races to be held on the 14th of June were both accepted which came as a pleasant surprise knowing that this was a very popular meeting with the ‘Continental Circus’ and entries were often heavily oversubscribed. The organisers were obviously keen, and duty bound, to accept the MZ Works team riders entries but in addition were somewhat obliged to accept entries from other East German riders who had acquired, or had been loaned, past years Works MZs, these bikes looked much the same as the current Works machines and were, in most cases, just as fast! Jawa and CZ Team riders were also, not surprisingly, placed at the front of the queue. 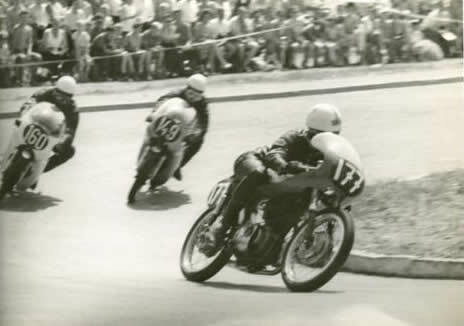 In addition to the ‘Eastern Block entries’ we knew there would be a very strong line up in both lightweight classes including Rhodesian Bruce Beale on the all new four-cylinder 250cc RC164 Works Honda! The weather was perfect and practice went reasonably well for me on both Parillas although I was beginning to encounter some gear change problems on the 125 near the end of the session. Whilst I had ridden against some quick MZs at Skofja Loka, their speed at Schleiz, and that of the RC 164 Honda, was a real eye opener and a bit of a shock to the system. It was clear that they had top speed advantages over ‘the also rans’, including my Parillas, of between 20 to 40 MPH! There was no way I was going to get a tow from any of these guys! During the first 250cc practice session, standing on the starting grid one row back from the Honda RC 164 and the Works MZs of Rosner and Krumpholz, I had been mesmerised by the sound of these machines and had not appreciated just how much damage was being done to my hearing. It took 2 or 3 days for my hearing to recover to the extent that I could have a normal conversation without shouting or holding a hand to one ear, a problem from which I have suffered to some extent up to the present time! A bit late in the day, but never again was I to ride a racing motorcycle or attend a race meeting without full ear protection. In developing our strategy for each race we clearly had to disregard the performances of the top Works riders with the exception that in a 15 lap race one, or more, of them would lap me on my Parilla at least once so we could fuel up for a 14 lap race. As it was to turn out, this prediction was correct but planning for it almost led to my undoing in the 250cc race! From the 3rd or 4th row I had a great start in the 125cc race and found myself mixed up with a group of screaming Bultacos just behind the leading MZs as we went through the sweeping curves at the end of the start and finishing straight. At the end of these high speed curves is a tight left hand bend and as I was to observe at close quarters on a number of occasions as the season progressed, the leading pack of MZs immediately got dutifully in line on the right hand side of the track to take the upcoming left hand bend – which left the door wide open for New Zealanders Ginger Molloy & Morrie Lowe, followed by myself, to dart down the inside and steal the bend! At least 4 or 5 riders jumped the MZs at this point of the race. It did not take them long to get their own back on me as they all went screaming past down the back straight! By slipstreaming, whenever I got the chance, I was still mixing it up with 2 of the old Works MZs when just over half way through the race, I found myself stuck in 3rd gear and out of it! 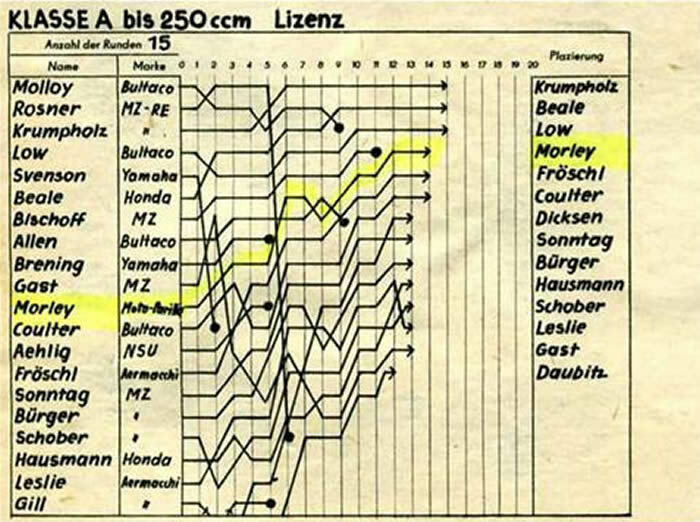 Again in the 250cc race, coming from the 4th or 5th row of the starting grid, I had a flying start, as documented by the local East German Press, and by repeatedly darting up the inside of the MZs (and even the Honda RC 164 on the first lap) I enjoyed a good race until the 13th lap when I realised I was beginning to run out of fuel! My plan to run only a 14 lap race was coming apart as surprisingly, I had not been lapped up to this point. 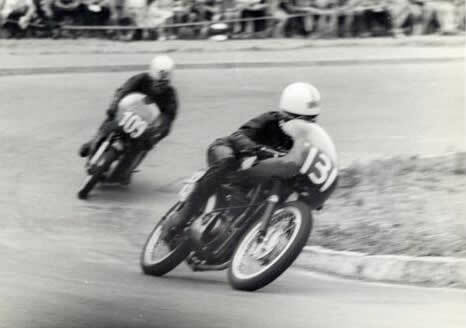 Being only just ahead of Franz Froschl (Aermacchi) and Bob Coulter (Bultaco) for fourth place, I could not conserve fuel by slowing too much without running the risk of being overtaken by them. I knew I could not complete another full lap & it was a relief when the leader, Krumpholz (MZ), shot past followed by Bruce Beale (Honda 4) on their final lap. I now had less than a quarter of the circuit to complete to record a finish. Reducing my speed further to a maximum 8,000 R.P.M I just made it to the finish with my 4th place finish in the bag. Morrie took 3rd place on his Bultaco. Back in the paddock, I asked Vic to check how much fuel I had left, he answered “none”. It was a close run thing but Lady Luck still appeared to be with us. Racing at Schleiz, and the results brought home to me a number of things and my thoughts on these matters have not changed much over the years. For Ginger Molloy and Morrie Lowe to have been mixing it up with the MZs of Rosner and Krumpholz on their home turf and with Bruce Beale on the RC 164 Honda, clearly demonstrated just how good the two New Zealand riders really were. 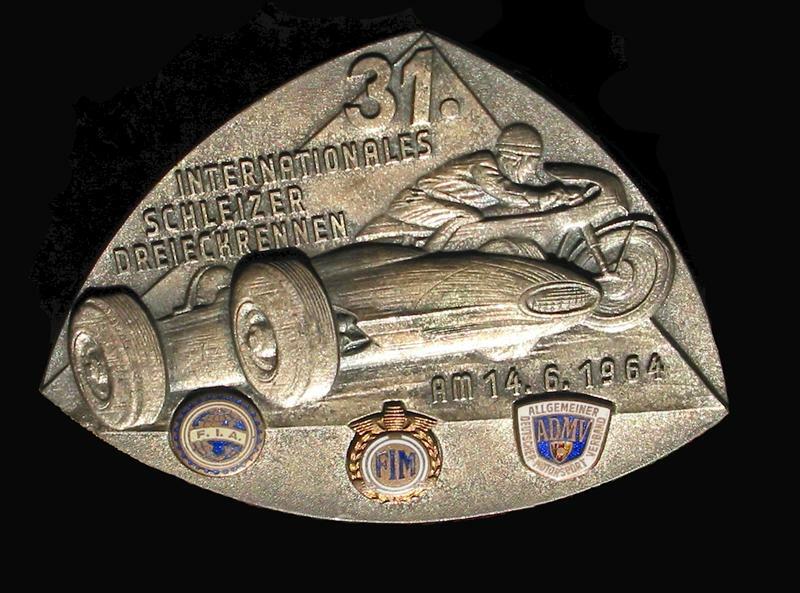 It came as no surprise to me that Ginger would go on to become a World Championship Grand Prix race winner, the fact that it did not happen sooner and that he was not given a top Japanese or Italian Works ride did. 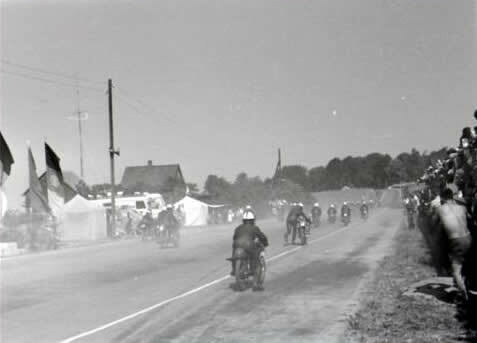 Whilst the MZ’s had a considerable power advantage over the rest of the field (with the exception of the RC 164 Honda), and Rosner and Krumpholz were great riders, their lack of regular racing week in and week out (as was the case for most riders based on their side of ‘The Iron Curtain’) put them at a considerable disadvantage when it came to ‘the cut and thrust’ of close quarters racing which we from the West experienced and enjoyed on a regular basis. My results on the 125 Parilla to this time had been somewhat misleading in that whilst my ‘steam engine’ was reliable, it was considerably down on power and top speed compared with the majority of the field and there was nothing we could do about this unless the short stroke engine we had originally intended to build became available. At the same time, we clearly needed to improve on the 125 gear selector mechanism.